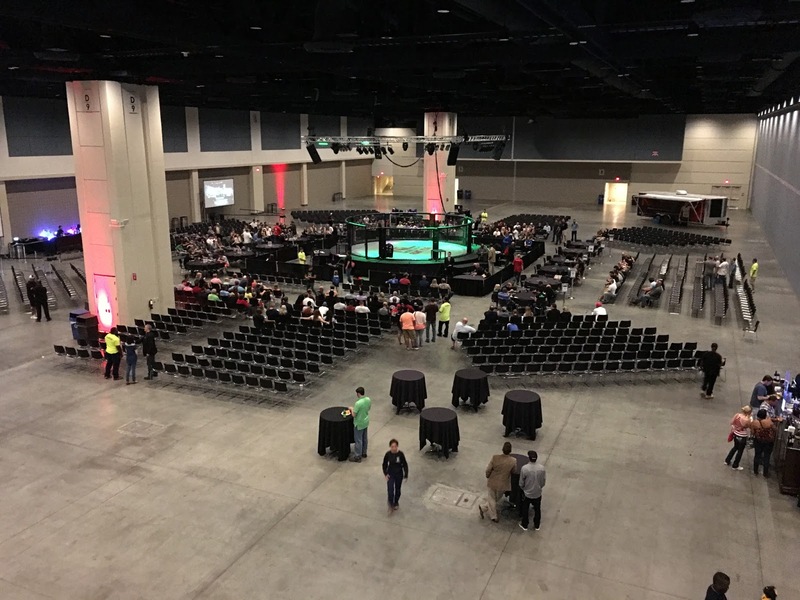 Last night, Kyle led a small group of us to watch local mixed martial arts matches at the Raleigh Convention Center, courtesy of area promotion Next Level Fight Club. I've been to multiple live MMA events before, but all of them were from the UFC, which is the leading promotion and easily the largest and richest and best of them all. I wasn't sure what to expect from a local show. I'm happy to report that all of us had a lot of fun. by the time we'd finished the first three (of nine) fights, the place was about two-thirds full. The fighters ranged from featherweights to heavyweights and from clearly talented to just learning. We saw decisions, submissions, and one rather amazing 16-second knockout. What struck me the most was that all of these people had to be doing this for love and for dreams, probably dreams of one day making it big. No one was getting rich. The fighters went into the cage, gave their all, and won or lost, but the money could not have been enough to justify the expense of training. Like so many people, including most writers, they were following a passion despite the fact that they were unlikely to ever be successful at it. I respected that a great deal. By the standards of Vegas shows, the seats were cheap, though by comparison to movies, they were expensive: some cost $30, while front-row seats, which we enjoyed, ran $80. I would absolutely do it again, and I recommend it to anyone interested in live MMA events. I presume the front row seats get blood splatter thrown in! There's enough other stuff--people working cage-side, a barrier with a low curtain--that blood is not a danger.